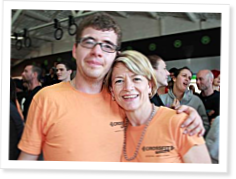 Mother Lynne Knapman explains how CrossFit changed life for her special-needs son. My 21-year-old son Chris participated in his first CrossFit competition a few months ago. What’s so special about that? Chris has a moderate intellectual disability. Along with this disability come poor muscle tone, a severe lack of spatial awareness, a very positive attitude and a predisposition to carry excess weight. We have always encouraged Chris to be active. He’s played many sports, including tennis, baseball, soccer and basketball—mostly in teams with other special-needs children/people. He is not a great athlete by any means, but what he lacks in skill he makes up for in attitude and effort. At this point, I would like to declare that my expectations for the competition were quite low. I primarily enrolled Chris so that when we talked about the box and CrossFit, he would have something to draw on and could join the conversation. I never dreamed Chris would be able to do any of the movements or a class at the box. He could not jump up a step let alone onto a box! Wow! What a great story. I will be doing the open work out today and will TRY to smile at the top of each one. What a fantastic story!! Truly amazing how crossfit reaches each of us where we are and helps us achieve things we never knew we could. Congratulations Chris! Congratulations Lynne! What a fantastic achievement! I love reading stories as this...Great work Chris I and wish you well on your future with CrossFit! We are worlds apart but I hope to one day cheer you on because this is truly what the community is about! Lynne. This is such an inspiring story. You, Keith, Pirri & Chris and no doubt all the Active crew have contributed to this success. Chris may do scaled movements but he tough's the WOD out just like any other CrossFit athlete & the community really gets behind him. Wouldn't it be great if you could take him LA this year; he's be a celebrity. So amazing! It's impossible to over-estimate the possibilities of Crossfit. I'm so glad it exists, especially for people like Chris. Chris can now do 4 strict pullups, a DEXA scan has shown a loss of 3.4kg of fat and an increase of a little over a kilo of muscle. He sometimes joins the regular classes and he's loving it! A big thank you to all the owners/trainers at CrossFit Active. What an inspiration. Thanks for sharing Lynne, I hope to see Chris much more in the future. It would be great if they could put together a Crossfit Special Games or something like that. Just shows that doing functional movements can help anyone. Congratulations to you and Chris, that is fantastic! I had a vision earlier about a box for special needs. Have you looked into this at all? Are there any classes/boxes you know of tailoring to special needs?